The Aerospec Technologies team works on clean energy solutions. Aerospec, which got its start at The Garage, is a finalist in the Cleantech University Prize competition. 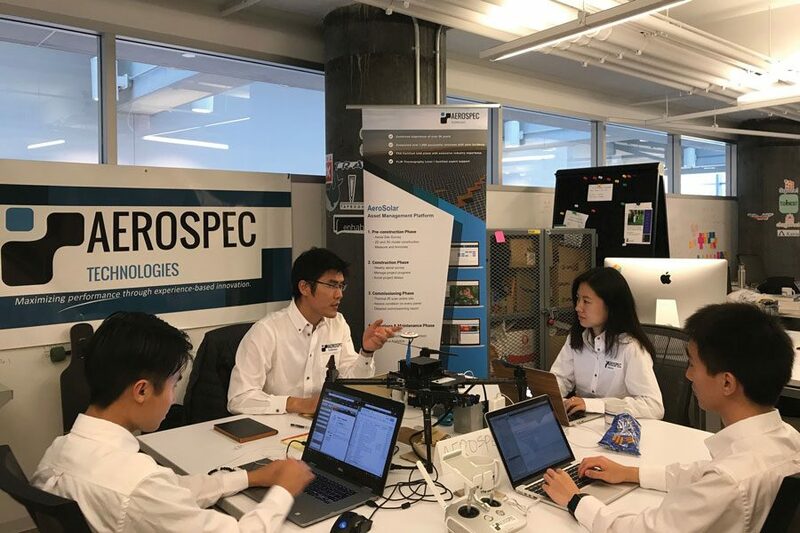 Aerospec Technologies — a company that was launched at Northwestern’s startup incubator The Garage — will represent Northwestern as one of eight finalists in the Cleantech University Prize competition this week. According to its website, the company “provides a turnkey solution using drone technology and big data analytics to efficiently manage solar and wind assets.” The company’s analytics platform processes data and pinpoints issues within minutes — as compared to the hours or days taken by other available technologies. The competition is run by Clean Energy Trust, a nonprofit that works to assist in the creation and growth of clean energy businesses in the Midwest. Its mission aligns with Aerospec’s visions for clean energy. “The purpose of this Department of Energy-sponsored program is to engage students who are working on clean energy ideas in the classroom and encourage them to continue shaping their ideas into real businesses,” said Emily Achler, director of marketing and communications for Clean Energy Trust. Aerospec provides services that include preventative maintenance, solar panel inspection and wind turbine blade inspection. Founder Lance Li, (Kellogg, ’17) said Aerospec received strong backing as a University-supported company. Li said he feels NU fostered a great environment for him to execute his ideas about clean energy and gave him a good space to create a legitimate company. Li said through his work with The Garage and various Kellogg faculty members, he was able to recruit interns like Seo, attend the startup fair, increase exposure for his company and receive backing from professors, who he said “never failed” to respond to emails or provide assistance when he reached out. Placing as one of the eight finalists may afford companies opportunities such as monetary grants, chances to participate in other competitions or the potential for their technology to be picked for use by the U.S. Department of Defense, Achler said. While Li said the other competitors were “very capable,” he believes Aerospec is “further along.” Regardless of placement or prize, though, Li said the competition has proven to be an important testament to the success and viability of the company as a whole. “(Being a finalist is) a validation of how far we’ve come,” Li said.